Males can grow to a shoulder height of 1,7 metres and weigh about 900 Kg. In spite of its heavy physique, eland are remarkably agile and large bulls can easily jump over regular fences. They have a slight hump at the shoulders and prominent dewlap. The heavy horns of both sexes slant backwards and lengths of as much as one metre have been recorded. Females are much smaller, weighing about 450 kilograms. Males have a patch of dark hair on their foreheads that covers glandular skin. Both males and females have fawn coloured coats. They also have faint vertical white stripes on their flanks, which are distinctive to the eland. The Eland is a browser, utilizing a wide diversity of plant species. It can exist for long periods without open water, but is then reliant on the fruits of Tsamas and Gemsbok Cucumbers to meet its water requirements. 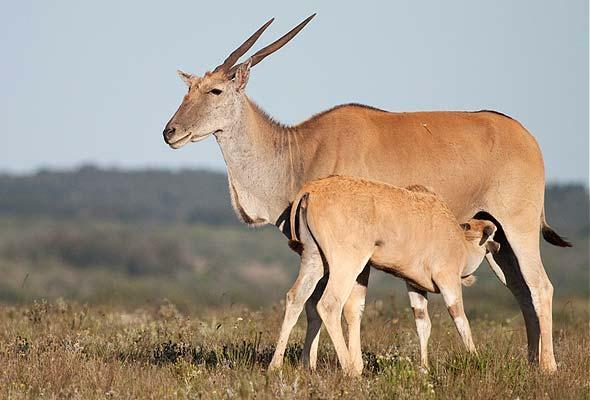 Although the Eland does not have a specific breeding season, in South Africa it has been noted that there are peak months when significantly more calves are born than in other months. A single calf is born to a mother after a gestation period of approximately nine months. Calves can run with the herd a few hours after birth. One of the interesting characteristics of an Eland herd is that it includes a nursery for the calves. When threatened by predators, the herd forms a front with the large males taking the lead positions while the calves and pregnant females are protected behind the fortress of large males. Since Eland herds migrate widely in search of good grazing, dominant bulls do not defend spatial territories. However, bulls do display territorial or possessive behaviour towards cows during oestrus. Preferred habitat varies from semi-deserts, grasslands, to light savannah north of the Orange river, to light woodland in KwaZulu-Natal. The Eland is a nocturnal animal and the vegetation that absorbs moisture from the atmosphere at night provides ample fluid sustenance for his large antelope that lives in areas with little surface water. Eland can be seen in most of the game reserves in South Africa. In areas where they used to roam and became extinct, they have been reintroduced with great success. Adult Eland are only preyed upon by lions and spotted hyenas and the young fall prey to most of the larger carnivores such as Leopards, Cheetahs and Wild Dogs.